Beverly Stowe McClure’s story, A Family for Leona, is a poignant tale of adoption that is sure to melt your heart. Eleven-year-old Leona Chapter and her five siblings experience hardship and loss before ending up in the Brooklyn School and Home for Destitute Children. One by one, the Chapter children are sent off in different directions and we wonder if and when they will reunite. The setting is the late eighteenth and early nineteenth centuries when trains carried orphans from New York to Texas. Leona is forced to board that train, all the while scheming for a way back to her family in New York. 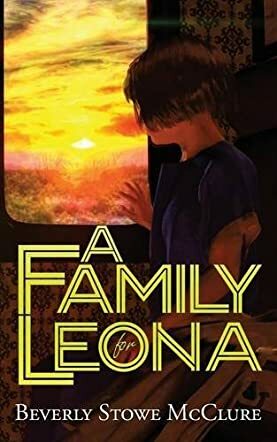 When Leona is selected from the group of homeless children and she finds herself riding over flat land in a Model T, the possibility of a return seems bleaker by the second, but Leona is tenacious and hopeful about returning. A Family for Leona is a story of hope and restoration geared to children and young teens. The adventures and trials Leona and her best friend, Noah, endure pull us into their plight and we cheer and ache with them. Their experiences from a tenement dwelling in Brooklyn to farm life in Texas are quirky, enchanting and ultimately satisfying. Beverly Stowe McClure’s emotional fictional narrative is beautifully written through the eyes of a stubborn adolescent girl with a penchant for increasing her vocabulary. With themes like new beginnings, friendship, love and family, I recommend A Family for Leona and rate this book 5 stars.